In 1901 Henry and Bertha Duckenfield were residing at 372 Springvale road, Crookes, Sheffield with their 2 year old son Harry. In 1911they were at 50 Marston Road Crookes, they had been joined by two more sons, Ernest and Austin aged 6 and 1 respectively. Harry was now 12 and at school, father Henry was 39 years of age and employed as a filer of surgical implements, mother Bertha was 32 years old. Harry's sister Hilda was born 1917. Young Harry was two months shy of his 18th birthday when he enlisted himself into the army on the 29th May 1916 at Sheffield. He was # 55189 of the 3rd Duke of Wellington Regiment. His occupation at the time was as a fitter. 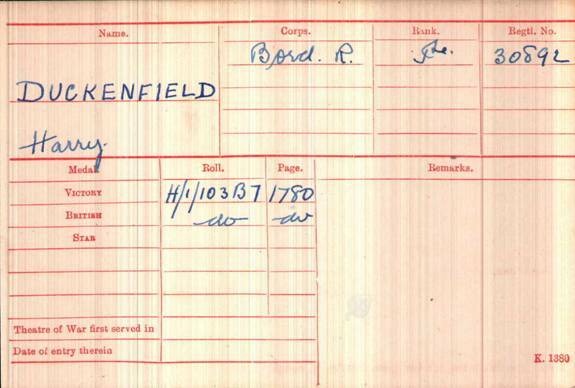 Harry was finally mobilized on the 27th June 1918, being posted to Box Depot BEF, North Shields on 16/10/1918. He embarked to France on 18/10/18 and landed the same day at Boulogne. Harry joined the Infantry Base Depot at Etaples on 19/10/18. He was quickly transferred to ‘C’ Company of the 7th Border Battalion # 30892 the next day, actually joining them on the 30th of October 1918. On the 8th of November 1918 Harry was wounded by a shell which broke both his Fibular and Tibuler in his lower right leg, and he had lost a lot of the bone from the leg. He was taken by 53rd Field Ambulance to 19th Casualty Clearing Station on the 9/11/18. By the 11/11/18 he was on ward 6 at 5th General Hospital at Rouen. Here he stayed past the Armistice of 11/11/18. On the 2nd of March 1919 he was transferred back to England on the Hospital Ship “Goorkha” to Southampton, thence on the 3rd to Mile End Military Hospital, London. Here his leg was put up into a ‘Thomas’ splint. Another hospital transfer, this time to the King George Hospital, Stamford street, London, on the 13th of May 1919, then again to the New End Military hospital on the 20th May 1919. Harry had another X-Ray of his leg on the 2nd June 1919, but due to the handwriting of the Doctor the location can not be read. His medical records show that on the 4th of June 1919 he is up and about on a set of crutches. Harry was finally discharged on the 21st of July 1920 after 392 days of treatment to his leg. It is not known how much of a recovery Harry made and if he limped or need a stick or crutches still. Harry’s medal index card shows he was awarded the Victory and the British War medals for his service. His pension papers survive on Ancestry. 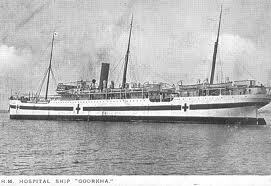 The hospital ship “Goorkha” on which Harry had sailed on back to England was once mined off Malta on 10/10/1917, she was repaired and re-entered service. She was finally broken up by Thos.W.Wards in 1928. Two comrades of Harry died on the same day he was wounded, were they the same incident ? Next to him lies Lance Corporal Ben Horn, # 14779 aged 22 of the 7th Borders, killed in action 8/11/1918, grave ref. D.47. Harry could so easily have been D.45 or D. 48.